Update 12:05 pm: 10 hours and counting. That's how long firefighters have been combating the downtown blaze at Happy's Pizza, starting shortly before 2 am this morning. The fire is still burning at this hour. As a result, Main Street from Packard to Hoover in Ann Arbor is closed due to the fire. The building is said to be a a total loss. So far, no injuries have been reported. The Happy’s Pizza at 600 South Main in downtown Ann Arbor is on fire this morning. The Ann Arbor Fire Department tells 89.1 WEMU it has been on the scene of the blaze since about 1 am this morning, and the battle continues. 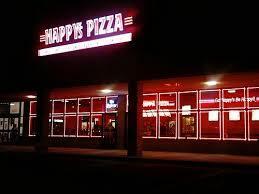 Happy’s is located on Main, right near Madison. Main Street is closed in both directions from Jefferson to Mosley. Motorists are advised to avoid the area.